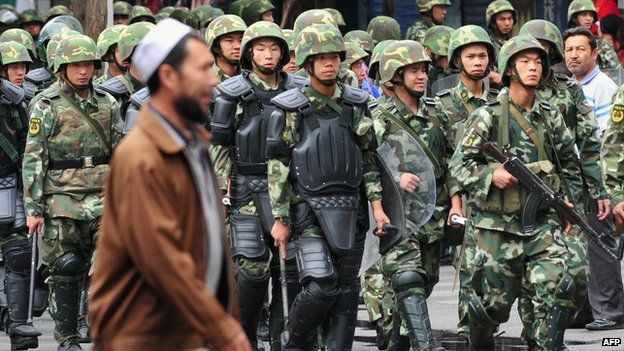 (TibetanReview.net, Nov26, 2015) – Eleven of the 28 members of what China’s official Xinhua news agency on Nov 20 described as a “terrorist gang” in Xinjiang killed by police in a 56-day manhunt were women and children, reported Radio Free Asia (RFA, Washington) Nov 24, citing local sources. The Xinhua report had said the manhunt and the killings followed a Sep 18 incident in which a group of armed mobsters attacked a coal mine in Baicheng County of Aksu Prefecture, killing 11 civilians, three policemen and two para-police members, injuring 18 others. Chinese police were reported to have targeted five families in the manhunt, detaining their indirect relatives and friends during the period. The report cited an unnamed food stall owner as saying nearly one-third of those killed in the manhunt were believed to be women and children traveling with male members of their families. The 28 suspects were believed to have been killed in a cave. China’s official People’s Liberation Army (PLA) Daily had reported Nov 23 that authorities had used a flamethrower to flush the suspects out of their cave before killing them. “Violence aimed at terrorizing the population is always utterly deplorable, but it does not shield the government’s response from scrutiny,” Sophie Richardson, China director at Human Rights Watch, was quoted as saying. China uses the slogan of cracking down on the “three evils” of terrorism, separatism, and religious extremism in Xinjiang. However experts and human rights groups say Beijing exaggerates the threat from Uyghur “separatists” in order to justify its excessive use of force and that domestic policies are responsible for an upsurge in violence that had left hundreds, mostly Uyghurs, dead since 2012. Like the Tibetans in Tibet, Uyghur Muslims in Xinjiang complain of pervasive ethnic discrimination, religious repression, and cultural suppression by China’s communist government.